The London Fire Brigade have criticised a children's cartoon for using the word "fireman" in an episode. In 'The Fire Engine' episode of the animated series Peppa Pig, the narrator says a female character dressed as a firefighter is a "fireman". 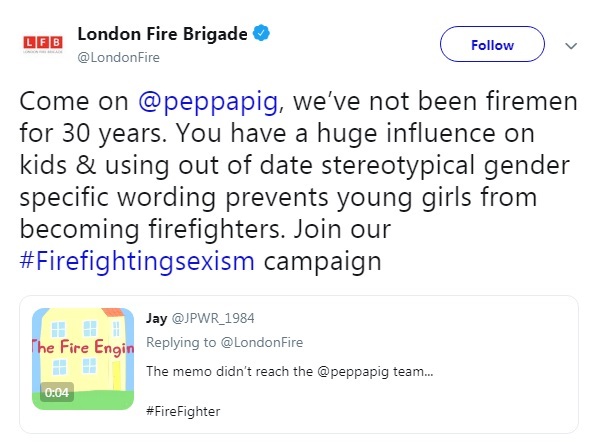 Responding to the clip on Twitter, the LFB attacked the cartoon's use of "gender specific wording". "Come on Peppa Pig, we've not been firemen for 30 years," they wrote. "You have a huge influence on kids & using out of date stereotypical gender specific wording prevents young girls from becoming firefighters. Join our #Firefightingsexism campaign." The comment attracted criticism from social media users, with one writing: "Oh, please. Have you got no fires to put out?". Another posted: "They’re talking pigs. Fire brigade or PC brigade?". The comments echo those made by the women's minister Victoria Atkins in February, who called for a "revised version" of Fireman Sam to challenge the stereotype that all firefighters are male. "I hope that we at some point see a revised version of Fireman Sam, because we know from social media campaigns that children grow up expecting firefighters to be male, which cuts off their career opportunities or their expectations as they go through school and into training," she told the House of Commons.